There are those who love lazy holidays at the beach, and then there are those who like being more active. 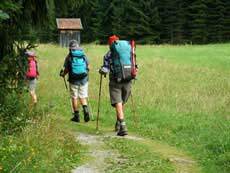 For many people, the ideal way to spend their free time is trekking or walking in the country. It's a chance to see some splendid scenery, to become one with nature, and let the wind blow the cobwebs of everyday life away. The first thing to realise is that a trekking or walking holiday isn't relaxing. Every day will see you pushing yourself a bit, and your leg muscles will really feel the effort. Well before you're going to leave, begin a workout regime to prepare yourself. Walking is the best exercise. Become used to covering several miles daily, over different terrain. Buy a stout but lightweight pair of walking shoes and wear them, along with good socks, until they're broken in and you're comfortable covering in them. If you're trekking, much of your time will be on horseback. So if you don't know how to ride, learning as soon as possible would be a good idea. Put in the hours gradually and become used to the saddle, or you'll soon wish you'd chose a different type of holiday. Both activities will have you out in the weather. Depending on where you're going in the world, and when, you'll need appropriate clothing, including lightweight rain gear and a good head covering. Those should also be light, to be worn in layers you can remove or put on depending on the temperature. In most places night will be chilly, so be prepared by packing a fleece. If you take prescribed medications, make sure you have enough for your entire trip. Going abroad? Carry a copy of the prescription with you. Also, take out adequate travel and health insurance. Keep everything to a minimum! Remember, you'll either be carrying it on your back or on a horse, so you can't take the kitchen sink with you. Buy waterproof packs - after a long day out in the rain you'll be glad you did. A first aid kit is more than an accessory, it's vital when you're out walking or riding. Make sure you include the necessities - insect repellent, sunscreen, antacids and anti-diarrhoeal, as well as antihistamine tablets. You'll need plasters, and it's worthwhile carrying some elastic bandages in case of a sprain (possibly the most common injury on the trails). Depending on where you are, adjust your kit with other items. Keep your valuables to a minimum, and carry them close to you at all times, in a money belt next to your skin. Carry a good map of the area you'll be covering, the higher detail the better. Fold it in a clear waterproof case and wear it around your neck, where it's readily accessible. Wherever possible, don't travel alone. Not only is it more fun to share the journey with someone else, another person can help in case of illness or injury. Create sensible daily goals, taking into account the terrain and the weather. Don't expect too much of yourself, especially in adverse conditions, and let others know the route you'll be taking and the time you expect to arrive at your destination - think of it as an extra insurance policy. If you're in a party with a guide, always follow the guide's instructions without question. It's their job to know the area and its dangers; after all, that's why you're paying them. When walking, your feet are your fortune. Each evening remove your boots, wash and powder your feet and allow them to breathe. That might seem obvious, but your toes will thank you for it when you don't develop any fungal diseases (however, carry anti-fungal cream, just in case). Dry your clothing, and especially your boots, overnight. Expect to eat more at every meal. You're expending a lot of energy and need to replace it. Don't worry, you'll be working it off each day. Carry a water bottle with you and drink from it regularly. Refill it every morning when you set out.